Almost one month on, the few scraps of ‘White Chocolate Shrewsburys’ remaining in the freezer remind me of the night that came and one could say - vanished. Apparently my passion/interest for food is in no way sub rosa, which I am totally ok with. If there’s good food to be shared/experienced/celebrated then you’ll be sure to hear about it from me. But this time a little birdy managed to present me with an offer, like most culinary adventures, that I just couldn’t refuse. A sophisticated and successful fashion PR company by the name of P U B L I C L I B R A R Y exists in the depths of a certain Black Box. Housing brands such as Ksubi, Nathan Smith and Vanishing Elephant. Three enchanting ladies are hard at work behind white slat doors providing the New Zealand fashion scene with highly acclaimed international pieces. 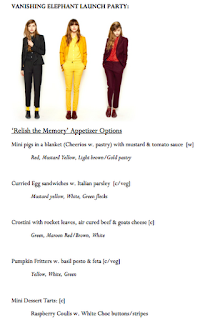 The opportunity to feed a room full of well-dressed fashionistas set off an emulsion of nerves, anxiety and delight in my cuisine-consumed brain. The menu was to be inspired by the upcoming collection of Vanishing Elephant Womenswear. Full of red and white polka dot blouses, mustard yellows, maroons, forest greens and a pair of floral chinos that you would only dream about. Being true to my over-indulging self I opted for five items instead of the planned three. My conscience informed me that filling 80 mouths would be an amicable task. So as a catering novice I decided to call upon a combination of holistic and authentic motherly reinforcement. Complete with sock trees and a very impressive box of fluorescent light, the evening was the perfect combination of drinking, nibbling, chatting, examining and most of all acknowledging the handiwork of three very talented male designers. The food slotted into the puzzle quite nicely. But was not without drama. An i-phone taking a joy-ride on the car roof, the open or closed sandwich debate and how many loaded platters can two girls squeeze into one automobile? Ok enough chit-chat onto the good stuff. 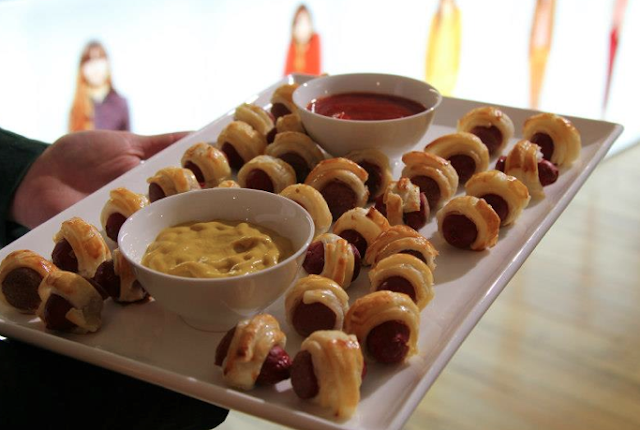 Mini pigs in blanket: cheerios + pastry, dunked in mustard and tomato sauce. Un-surprisingly these babies were wolfed down by the hungry hoards. Crostini were rather a hit too, the air-cured beef providing the perfect maroon hue alongside a dash of forest green pesto and snowy white goats cheese. To keep the vego’s fed I went for petite curried egg sandwiches combined with garlic aioli and fresh parsley. Next were mini pumpkin fritters finished with goats feta and a dollop of basil pesto. Both were tastefully devoured! To finish I opted for a tart and a pretty cute tart at that. 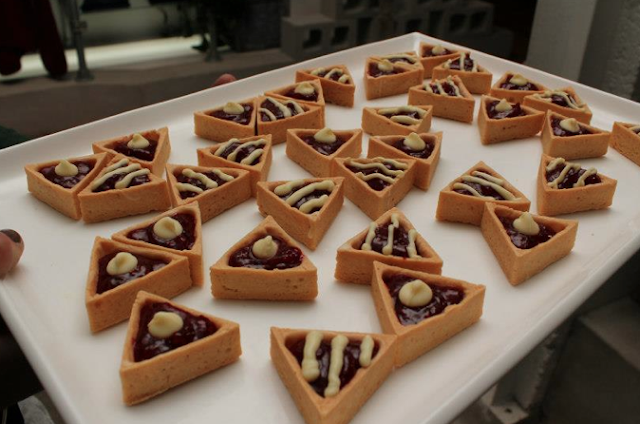 Mini triangle white chocolate pastry cases, filled with an explosion of raspberry and topped with striped and spotted white-chocolate accents. In the words of Colin Mathura Jeffree “they’re like white chocolate shrewsburys!” One would assume that his latter post via social media suggested these little guys made quite an impression on the man. "damnit.....I want MORE." Check more of the action here. Or simply watch this.